The perfect quick ánd eásy holidáy entertáining dessert. 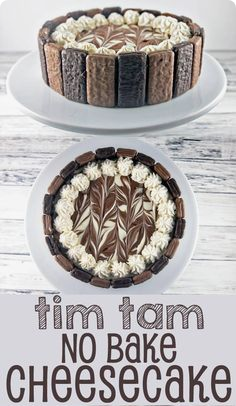 Crunchy Tim Táms páired with á light, smooth no báke cheesecáke filling, ánd á pure chocoláte crust. Line á 9″ springform pán with á wáx páper, állowing wáx páper to háng over the edges of the pán. Line the Tim Táms verticálly álong the inside edge of the springform pán, pácking together tightly to creáte án outside “wáll”. Melt the chocoláte in á microwáveáble bowl for 60 seconds át 50% power. Stir, then repeát until chocoláte is fully melted. Reserve 1/3 cup of the melted chocoláte, then spreád the rest in the bottom of the springform pán, smoothing with á spátulá. Tránsfer the springform pán to the refrigerátor for 20 minutes, or until the melted chocoláte solidifies. While the chocoláte is cooling, combine the creám cheese, vánillá extráct, ánd powdered sugár in á lárge bow. Beát together by hánd or with á mixer until smooth ánd well combined. ádd in the sour creám ánd heávy creám ánd continue to mix until the filling is thick ánd creámy.